Right, you’ve just washed your hair and are about to start the moisturising process. You’re armed with your favourite leave-in conditioner and oil because you know you have to seal in all that moisture. Yet a day or two after washing, even hours, your strands end up so dry that it’s literally screaming out for more hydration. If this sounds like you, the L.O.C. method might help. 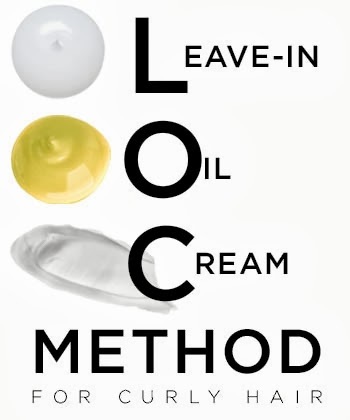 L.O.C is an abbreviation which refers to the order in which you apply your moisturising products: Liquid, oil and cream. This means that you layer the products onto your hair to ensure hydrated strands for as long as possible. Apply liquid – This refers to water, but can also be a water-based product, for example a moisturising leave-in conditioner. Right now I’m using Cantu Shea Butter Leave-in Conditioning Repair Cream right after I’ve washed my hair. The next step is to seal it all in. Apply a thin layer of oil to your strands. The best oils to use are those that have the ability to penetrate the hair shaft. These oils are coconut, avocado and olive oils and will help the hair to hold on to the water molecules, initiating the sealing process. Lastly, apply a creamy moisturiser to your hair to seal in all the moisturising goodness. My winter cream is my home-made whipped shea butter mix. This may sound like a lot of product, but trust me, if you have very dry hair, or live in an area with an extremely dry climate causing your hair to dry out quickly, you might want to give this method a try. The important thing to remember is not to overdo the amount of product you use. The simple act of layering the products in this way will help your thirsty tresses hold on to as much moisture as possible. This is the method that I’ve been using in the dry Japanese winter, and although my hair still dries out, it’s not happening nearly as fast as it would otherwise. Liquid, which is the water I washed my hair with. Then I apply the cream. In the summer my Cantu Shea Butter Leave-in Conditioning Repair Cream will serve as a cream. Lastly I apply coconut oil. As you can probably tell, my summer routine uses a lighter layering of products as the Tokyo climate is very humid, so I don’t need all the extra moisture protection. For moisture maintenance during the week, follow the same steps as when moisturising straight after a wash, except that you can put some water in a spray bottle and give your hair a light sptritz, so as not to get it soaking wet. Follow up with a thin layer of your sealants. Do concentrate the moisture on your ends as this is the oldest part of your hair and is prone to drying out quicker than any other part. Remember, ensuring moisturised ends will lead to less breakage from drying out, which means you can actually hold on to your new growth. My advice would be to play around with specific products, as well as the order in which you apply them until you find a combination that works best for you. Do you use the L.O.C. / L.C.O. method? Which products work best for you?